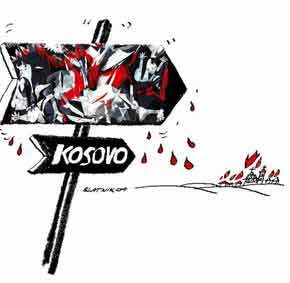 On last February, 17th, the streets of Pristina, a usually quiet and provincial city, celebrated the birth of a new state when the kosovar authorities unilaterally declared the independence of Kosovo. Not only the independence of this Serbian province (which had been under international mandate since 1999) is ending the long carving of what was once Yugoslavia but is also setting a precedent in international politics. The kosovars, by geographical definition, are an ethnic majority within a state where they only represent an active minority among others (mainly Serbian). By letting Kosovo declare its independance, the European Union and the United States paved the way to further conflicts and political turmoil in a region often subject to hatred and civil unrest.Indeed, while self-autonomy and the fight for civil rights are legitimate for any community which suffers from under-representation, depraving a sovereign country of one of its provinces without any legal framework is not. The complex process of creating new states is a mixture of fact and law, involving the establishment of particular factual conditions and compliance with relevant rules or customs. To that regard only a few examples, in the recent history of international relations, have proved to be legal and commonly accepted. The fall of the Soviet Union in December 1991, or the partition of Tchekoslovakia when both entities decided to go their own way after a referendum, are actual good examples of political and international consencus around the idea of giving a group of people a place that they can call their own. Unfortunately the past two weeks have shown us how conflictual and dangerous it is to let a shadow government, still not long ago considered as a terrorist group by the U.S. State Department (the Kosovo Liberation Army, then led by Hashim Thaci, was considered a terrorist organization until 1998), seize formal power and confiscate a territory without international mediation nor tangible legal grounds. On February, 19th, more than a thousand ethnic Serbs calling for their own independence, destroyed two border stations dividing Serbia and Kosovo. On February, 22nd, more than 150 000 people demonstrated in the streets of Belgrade to protest against the Kosovar state (aside of this peaceful demonstration the U.S delegation and other European embassies were deliberately set on fire by a group of extremists) and on the very same day, as if this was not enough to increase the already existing tensions, the parliament of the autonomous Serbian Republic of Bosnia indicated that it would seek full independence if Kosovo gained wider international recognition, saying that « Europe had a double standard policy regarding Kosovo and Bosnia. ». The European Union, still largely divided on the issue, the U.S government far from understanding the subtlety of Balkan politics and finally Russia, well disposed towards Serbia, are now playing a dangerous diplomatic game with no written rules. Unfortunately their political intervention only add to the growing tensions that divide a region where the «prescribed» status of any man is far more socially important than his « acquired » status. In the light of the Russia-Georgia conflict, which started in South Ossetia last August, one can wonder what might happen next…Pandora’s box is now open wide and one can only imagine what some other communities will do now that the dice are cast. Will Transnistria seceede from Moldavia ? What about Macedonia..Will it declare its independence from Greece ? And the Palestinians, would they ask for immediate international recognition ? Would the Kurds unite and call for transnational reunification ? And finally will history repeat itself ? Left with no other choice to only face eachother, it is now up to Kosovo and Serbia to come to terms and try to compromize and the «non-negiotiable» issues and promote mutual understanding, the only key to an everlasting peace.